HACO Translation Center is the pioneer in translation services. With many years of professional experience and good results of big projects, we have enough self-confidence to be in charge of Italian – ensuring perfect results suitable with your style, completing quickly and serving thoughtfully, matching with our strategy “Happiness when you come, satisfaction when you leave”. Italian (Italiano) is a language of the Roman group of the Indo-European language family and used by 70 million people mainly living in Italy. Italian accent considered standard now is accent of Toscana area (English: Tuscany, French: Toscana), especially accent of people living in Firenze city (or Florence). In Italian peninsula and adjacent islands, it is considered intermediary among southern accents (belongs to the southern branch of the Roman group) and northern (belongs to Gaul-Roman group, a part of Roman group). 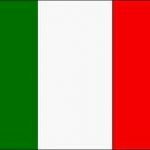 In particular, among the Romance languages, Italian is the closest to Latin. As other languages of the group, it uses a lot of stress in pronunciation. Italian uses Latin alphabet. In the standard Italian alphabet, there are no characters J, K, W, X and Y, but they are still present in Italian borrowing word such as jeans, whisky hay taxi. In order to replace corresponding sounds of the above characters, may use gi instead of j, c or ch instead of k, u or v instead of w, s, ss, or cs instead of x and i instead of y (it depends on each word). In order to mark pronunciation and stress, Italian also uses acute accent and grave accent, for example grave accent for letters A, I, O and U at the end of words. That means stress is put on that vowel sound (gioventù, youth). The letter H at the beginning of the word is used to distinguish ho, hai, ha, hanno (present tense of the verb avere, có) from o, ai , a (preposition), anno (five). This letter is also present at the beginning of some nonnative words such as hotel. In most cases, H is silent sound (not be pronounced), such as hotel is pronounced /oˈtɛl/. Transformation from Latin to modern Italian is a quite complicated process because a lot of languages were used in Italian peninsula before and during formation of Roman Empire. Although classical Latin was used as an official language, people in different areas of this empire continued to use their local language. When necessary, they used a kind of Latin that was simplified a lot in transaction with authors: this is democratic-mannered Latin (Vulgar Latin). Before the democratic-mannered Latin could completely unify a lot of local accents in territory of Roman empire, this empire dissolved at the end of the 5th century. This “half” unification has created a group of languages currently used in Western Europe – Roman group – Italian is a typical one. Italian, therefore, is under the influence of not only Latin but also other local languages. The earliest Italian document still exists is form of Benevento area at the middle of the 10th century. However, it is admitted that Italian, as we know currently, just actually formed after Dante Alighieri wrote long collect of poems (La Divina Commedia) in the 14th century. Linguists classified Italian into Italy-Dalmatia branch, a small branch of Italy-West of Roman group of Indo-European Language family. Languages which are closest to Italian are Napolian, Sicilian and Italian-Hebrew, and languages in northern of Italy such as Ligurian, Lombard, and Piedmont…. and Romanian, Spanish, Portuguese and French. Italian is the official language of following countries: Italy, San Marino, Vatican, Switzerland and some areas of Croatia and Slovene. 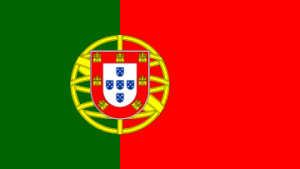 Some countries having the considerable number of people using Italian are: Albania, Argentina, Brazil, Canada, U.S, Luxembourg, Malta, Australia and Venezuela. In addition, some old colonies of Italy such as Somalia, Libya and Eritrea still have Italian-spoken people. Expand relationship among Vietnam and EU, Belgium, Italy and U.K. 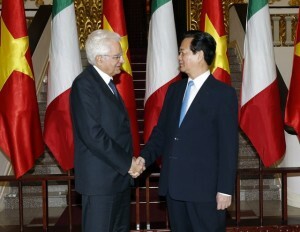 Establish strategic partner relations between Vietnam and Italy.